to begin to release the tensions, to calm the busy mind, to connect to the body and all of its messages. Offer yourself many moments through the day to breathe deeply, pausing to awaken to the moment of your life that is right now. It's truly the only moment you ever have. Peace!! Peace is a practice that takes place in each moment. Every moment is an opportunity for health and healing, for awareness and insight, for compassion and change. When we can embrace our inner Being, our life unfolds with miracles. Mindfulness offers a moment-by-moment peace practice. Staying connected to what is contained in the present and embracing it with openness and curiosity helps to support "living" our life, not just "doing" our life. The present moment contains the only life we will ever have. The past has already left us and the future has not yet arrived. What we do in this moment creates all future moments and determines how our life will unfold. Living in Peace now, taking each step with awareness and healthy intention, allows our life to blossom big!! Below are a few moment-by-moment steps that we can take to help maintain our awareness and to develop strength, stability, and solidity. Please bring them into your life and share with others. And please visit the Resource Page for more connection points and recordings. “TAKE 3” are fast and easy ways to stay grounded and stable through the day, to build the muscle of mindfulness, and to act as stopping points to switch gears as needed. When we Slow to Know, we create change on the spot. It’s all good practice so enjoy what you discover and love yourself strong! 3 Sips: Stop and enjoy the first 3 sips of your coffee or tea. We look forward to this every morning but often rush through it to get ready for the day. Let 3 Sips settle your energy, body, and mind so that you can be more settled and grounded for the day that lies ahead. 3 Meal Minutes: Eat the first 3 minutes of each meal, including snacks, in silence. Keep your attention on the food (the flavor, texture, smell, color, sight) and the whole process of eating (how we hold our utensil, chew, swallow, seek more). Notice how this food is being received by your body, what your mental and emotional state is right now, and how easing tensions brings more harmony and healthy nutrients to your body. 3 Breaths: At every transition point, take 3 breaths. Become aware that you have shifted from one location or activity to another. Let whatever it is that you were doing / where you were to stay behind. Turn your attention to right now - to your breath and body. Create a blank canvas so that you can show up fully for what is next. For instance, if you are agitated about a meeting you just left, do you really want it to dictate how you interact with the next person? 3 Steps: Every time you get up to walk or change locations, be present to the first 3 steps. Use this opportunity to feel your feet, notice your breath, become aware of your body. Give your mind and thinking a break of 3 Steps. 3 Rings: Most everyone carries a cell phone... creating a lot of reactivity. Begin to use your cell phone as a practice point. 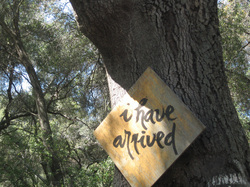 When it rings, purposefully pause and become present. If you choose to answer the phone, give it 3 rings. Use #1 ring to notice the sound of the ring, #2 ring to become present to yourself, and #3 ring to become present to whomever may be on the other end. That way, when you answer you are fully attentive to the other person and the details of the call, much different than still being engaged in your initial activity and not really paying attention. How many times have we done that?? With this ringing reminder, the conversation may be more productive and the caller will be appreciate your listening. Breathing is the best and most natural tool to help relieve stress, tension and anxiety. It helps to calm all of our systems, oxygenates and energizes our body, and cleanses to release toxins. 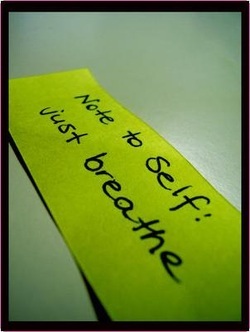 To de-stress using your breath, simply stop for a moment and notice your body. Breathing through your nose, breathe deep and slow, filling your lungs so completely that your belly expands. Relax the muscles of your belly as you breathe in. When you breathe out, breathe out slowly as well, emptying the lungs completely from the top to the middle to the bottom of your lungs. When you breathe all the way out, your belly will gently come in. Always try to breathe in and out through your nose to help warm, cleanse, and regulate the air. This is called Belly Breath or Diaphragmatic Breathing. Whenever you are feeling tense, upset, overwhelmed or stressed, take a few of these de-stress breaths. Let the freshness of the breath come in and allow all tensions to release out. I recommend doing 10 of these breaths once every hour, even if you aren’t feeling overwhelmed. It’ll help for those times that “sneak up” on you. It takes less than one minute to complete 10 breaths. We all have a minute so give yourself this amazing energy break!! Stay present to each breath, gently closing your eyes if that's appropriate. No one will know what you are doing, only that a general state of calm in you. Listening deeply is a loving kindness in action. When we listen deeply to another, we remove our internal dialogue of corrections, comebacks, advice, judgments, and barriers. We simply listen with open awareness, open mind, and open heart. We listen in order to understand the other person, their perspective, their difficulty, their state of being. We allow the space for their expression to be heard. If you’ve ever truly been listened to, you know how powerful this practice can be! Suffering feels like it comes from many different directions and it’s easy to look outside of ourselves for explanation or justification. When difficulty arrives in relationship, it’s easy to look at the other person as the cause of our suffering and to strike out in words or actions. This only serves to create further suffering, however, and exasperates our poor connection. When we use mindful, loving speech, we express ourselves only from our experience. “My” hurt, “My” pain, “I” felt this, “I” got scared when...all serve to communicate our experience in a way that is is truthful and personal. With awareness, kindness, and calm, we do not tell the other person what they did wrong but rather share the circumstances that led to how we feel or the thoughts we have. We take responsibility for how we have added to our suffering and the suffering within the relationship. When using the “I” perspective, our partner (using Deep Listening) will not feel a need to defend him/herself but can instead support us by developing deeper understanding of our pain. Our relationship can begin to heal. We can begin to heal.